Six of our BA (Hons) Architecture Stage 3 students took part in a ‘Client Feedback’ session for their ‘Urban Intervention’ design projects, organised by Stage 3 Coordinator Chloe Street Tarbatt on 20th February. Urban Intervention is a design project which takes place in the Autumn term of Stage 3. The module engages students in the re-design of an existing urban centre or locality in two parts, beginning with a master-plan and public realm study, and moving on to the design of a detailed building design adapting and/or extending the existing building fabric. Urban design is the practice of designing towns and cities. This is architecture approached at an urban scale, ranging from a neighbourhood to an entire city. The adaptation and extension of existing buildings for new uses is also a staple of architectural design practice, ranging from unobtrusive to the complete visual overhaul and updating of an existing building. The brief for this year’s project was based at the University of Kent’s Medway Campus, which straddles the Pembroke site (shared with Greenwich and Canterbury Christchurch Universities), and The Historic Dockyard, Chatham. 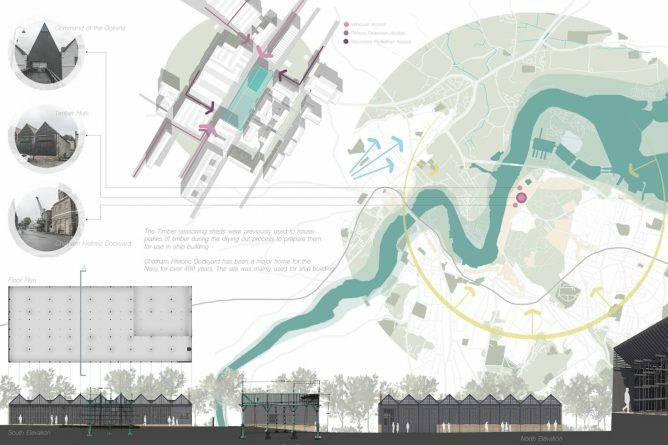 The School of Architecture was approached by the Dean for the University of Kent Medway campus, Professor Nick Grief, who showed interest in collaborating with KSA on developing proposals for improving circulation links between the two sites, and upgrading the quality of public realm. Several students signed up for the design charette in Spring 2017, which kick-started the School’s involvement with the project, introducing the unusual qualities of the area, and the potential to be involved in developing ideas for the future development of Chatham Historic Dockyard. The advantages of working on this type of ‘Live Project’ are significant in providing students with a network of real clients, an insight into the complexities of development, and the ways in which society at large, shapes our role and agency as architects / designers. Six students were asked to present their final design projects for ‘Urban Intervention’ in a ‘Client Feedback’ session at the Sail and Colour Loft on the Chatham Historic Dockyard site to Professor Nick Grief, Bill Ferris, CEO of Chatham Historic Dockyard Trust and Duncan Berntsen from Medway Council. The ‘clients’ involved expressed great enthusiasm for the work presented, and noted that the professionalism and confidence exhibited was outstanding, and their presentations both inspiring and hugely impressive in all respects.